Art Historian Timothy Verdon directs the Diocesan Office of Sacred Art and Church Cultural Heritage in Florence, and the Cathedral Foundation Museum (Museo dell’Opera di Santa Maria del Fiore). The author of many books and articles, he has been a Consultant to the Vatican Commission for Church Cultural Heritage, a Fellow of the Harvard University Center for Italian Renaissance Studies, and currently teaches in the Florence Program of Stanford University. Msgr. Verdon is a Canon of the Cathedral, the Director of the Florence Archdiocese Center for Ecumenism, and the Academic Director of the Mount Tabor Centre for Art and Spirituality. William Dyrness is a professor of theology and culture at Fuller Theological Seminary in California. He teaches courses on theology, culture, and the arts, and was a founding member of the Brehm Center for Worship, Theology, and the Arts. He has published many books, and served on the national boards of Christians in the Visual Arts, and Development Associates International. He has over 30 years of teaching experience in the United States, the Philippines, Kenya, and South Korea, and is an ordained Presbyterian minister. Deborah Sokolove is the Director of the Henry Luce III Center for the Arts and Religion at Wesley Theological Seminary, where she is also Professor of Art and Worship. Most of her courses and her writing focus on the intersection of the arts with theology, liturgy, and culture. In addition to her teaching and writing books and articles, she also maintains an active studio practice as a painter. Her paintings have been shown locally and nationally, and are represented in numerous collections. Sokolove is a member of the American Academy of Religion, the North American Academy of Liturgy, Christians in the Visual Arts, and is on the Board of Directors of the Society for the Arts in Religious and Theological Studies. She is a Steward of Seekers Church, an intentional Christian congregation in the tradition of Church of the Saviour, where she serves on the worship planning group and frequently preaches and leads worship. Denis Hétier is Director of the Higher Institute of Theology of the Arts at the Catholic Institute of Paris, and is an artist, sculptor, and priest of the diocese of Créteil. Martin Shannon is an Episcopal priest and member of the Community of Jesus, an ecumenical Benedictine community on Cape Cod, Massachusetts, where he lives with his wife and grown children. He is the Program Director of Mount Tabor Ecumenical Centre for Art and Spirituality. He earned his M.Div. from Gordon-Conwell Theological Seminary, and a Ph.D. in Liturgical Studies from the Catholic University of America. Susan Kanaga has been a member of the Community of Jesus since 1983. She has studied the art of mosaic in Ravenna with Alessandra Caprara, of Mosaici Antichi e Moderni, and helped realize the mosaic pavement of the Church of the Transfiguration, at Orleans, MA. In 2004 Susan was commissioned to design a creation cycle for stone sculpture for the Atrium of the Church of the Transfiguration. Susan has collaborated with Italian and American publishers for cover designs and has exhibited at the Mount Tabor Ecumenical Centre for Art and Spirituality in Barga (LU) and Orleans, MA. Other exhibits include shows in Bergamo and Florence, Italy, Washington, DC, Portland, ME, and Kansas City, MO. 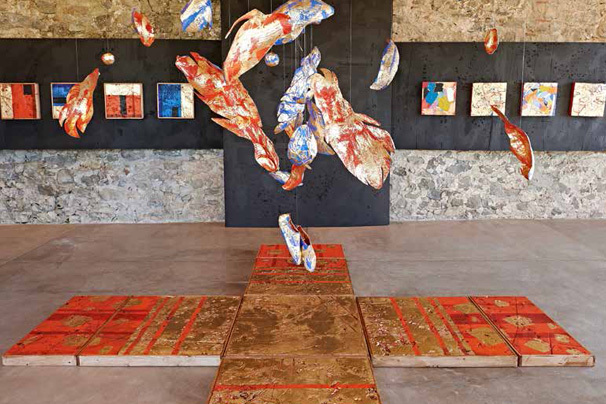 Filippo Rossi has been exhibiting since 1994, and has worked as a site-specific artist for private and public patrons. Since 1997 he has been visiting professor at the Stanford University Centre for Overseas Studies in Florence. He conducts workshops in the United States and Italy. He has recently done solo shows at the Museo della Porziuncola (Assisi), the Arcionfraternita della Misericordia and the Basilica of Santa Croce (Florence), the Monastery of Camaldoli (Arezzo) the Abbaye Notre-Dame de Boscodon in Crots (France), the Mount Tabor Centre, Palazzo Panciatichi, and Palazzo Medici Riccardi (Florence), Meiboyi Arts Centre (Shanghai), Bressanone, Bergamo, Cortona, Morocco, and the Italian Embassies in Rome, Fondazzione Ducci in Rome and Dadian gallery in Washington, DC.